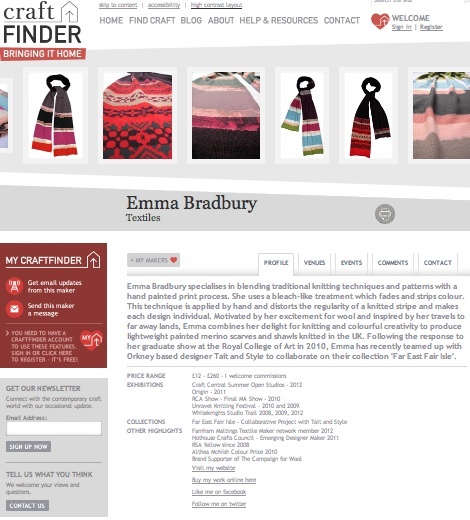 I have a page on Craftfinder – http://www.craftfinder.org.uk/makers/emma-bradbury.aspx Its a great website with lovely images of work by UK designer makers. Craftfinder, a new national online venture connecting makers with lovers of contemporary craft. A unique initiative, it provides a growing resource for everyone who loves contemporary craft. Craftfinder aims to help everyone to share in the excitement of finding something they love, wherever they are in the UK. It enables people who love craft to find, visit and enjoy beautifully made contemporary craft for real.